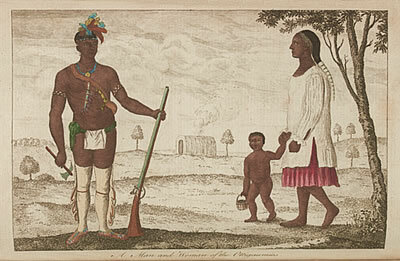 This striking copper colorplate image is one of two illustrations of Indians presented in this work. The other colorplate illustration is entitled "The Tobacco Plant." These two images reflect the popular interests of the reading public. Carver noted, "The men of every [Indian] nation differ in their dress very little from each other, except those who trade with the Europeans, these exchange their furs for blankets, shirts, and other apparel, which they wear as much for ornament as necessity . . . They paint their faces red and black, which they esteem as greatly ornamental." Nearly one hundred years after its publication, the noted historian Moses Coit Tyler described the work as having "unsurpassed value" and offering "true and precise" information concerning the "manners, customs, religion, and language of the Indians." Subsequent scholarship, however, has cast serious doubt upon the authenticity and accuracy of the text. E.G. Bourne, in a 1906 essay published in the American Historical Review, summarized the situation, "Scholars are in general agreement that much of the work in this volume is an abridgement or adaptation of historical writings by Charlevoix, Adair, and La Hontan. Entire chapters read as near verbatim text from one or more of these other authors."